As my kids get older, with jobs and schedules and kids of their own, it gets harder to find a day and time to celebrate the holidays with them. After much discussion and schedule checking, it appears we will be celebrating our family Christmas in mid December... and that made me realize I only have a couple weeks to plan, bake, decorate and shop for gifts. The kids have told me they will have their wish lists to me by Thanksgiving, so my mantra for the next three weeks is this: Everything is figureoutable. It may seem a bit daunting, but everything always works out in the end. So today I'm sharing my Figureoutable card. I started with a piece of Fabriano hot press watercolor paper. I cut a mask from 3-M Post It tape with a circle die to protect my moon. 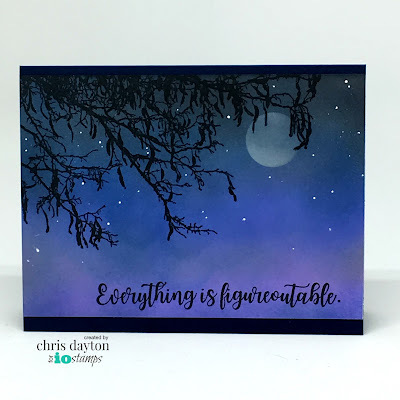 I then sponged in Distress Oxide inks to create a night sky. I removed the circle mask, and added a bit of shading and shadow color to the moon before stamping the Spooky Branch and Figureoutable sentiment with Versafine Black Onyx ink. I added stars with a white gel pen and trimmed the inked panel to 5.5 x 4" and adhered it to a black A2 top fold card base.